I’m sure you are either sick of reading about our “Hawaii Diet” or intrigued to know what it’s all about and see what we’ve been eating to get in swimsuit shape. So I thought over the next week I’d share some of our tried and true super healthy, and super delicious, meals we’ve been enjoying lately! Let me just say that the oven temperature is correct! I was even skeptical at first. The high heat is what helps everything get really roasted with the char spots on them, and makes it cook really fast. You can always adjust the seasoning to your liking but the way I have the recipe here is exactly how I do it. 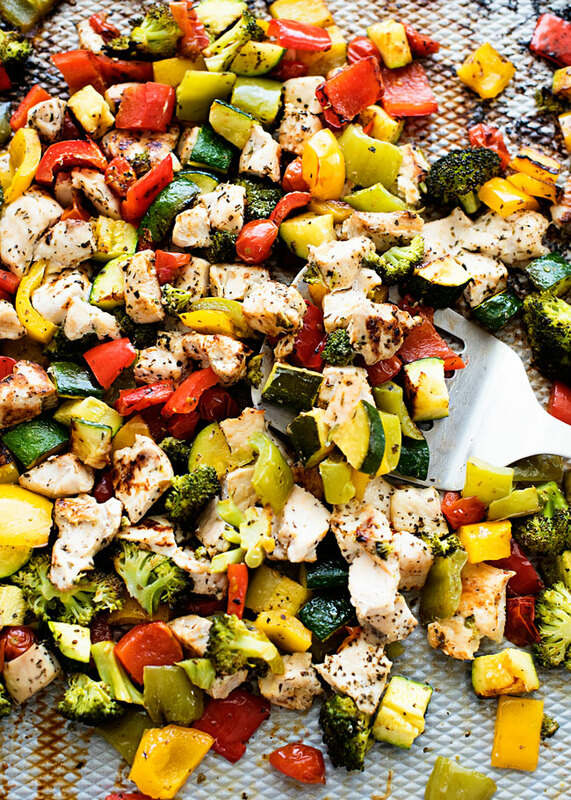 This easy 30-minute one-pan meal has become one of our most favorites! Preheat oven to 475° F. Spray a large baking sheet with cooking spray. Chop all the veggies into large pieces. On a separate plate or cutting board chop all the chicken in large cubes. 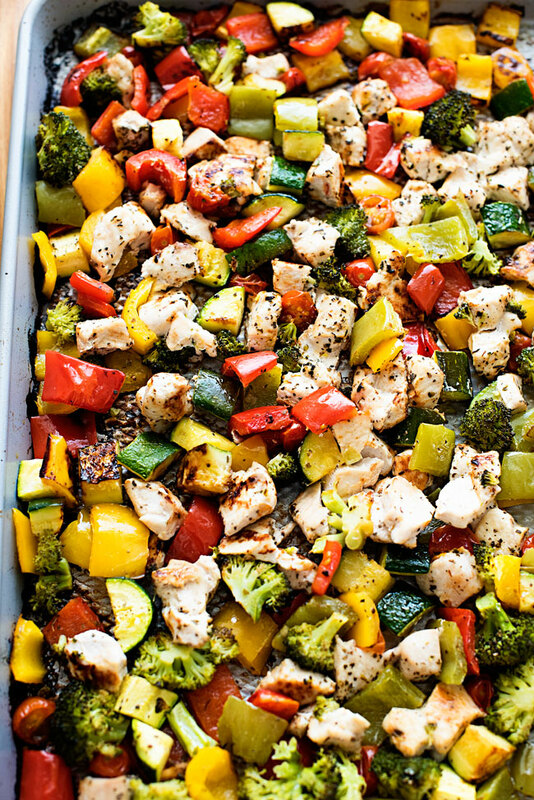 Place the chicken and veggies on the prepared baking sheet. Add the olive oil, salt, pepper and Italian seasoning. Toss to combine. Bake for 15 to 20 minutes or until the veggies are charred and chicken is cooked through. Looks delicious! Simple yet filling. Will try this week! I made this today for lunch. Very delicious and satisfying! Thanks for another great recipe. 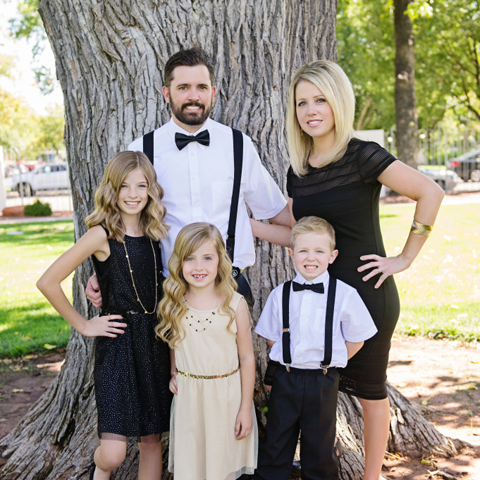 Try this combo too–my family love it! Wash and chop all veggies to same size chunks. In bowl mix veggies olive oil salt and pepper and herbes de Provence. Divide between 2 sheet trays bake at 425 for about 40-45 minutes or until soft. Yum! Cooking it right now! I added pineapple to it. The smell in the house is fantastic!! Will be serving on tortillas. I CANNOT WAIT TO EAT!! I LOVE one pot/pan meals, especially in the oven! Can’t wait to try this. I also checked out your other recipes and discovered Crock Pot Chicken Fajitas. 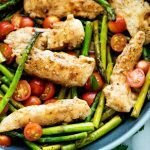 Yummly has the nutrition listed for this recipe on it’s site. It’s at the bottom of the page. 180 Calories; 9g fat; 11g carbs (5g are sugar). I reduce the fat by not using the Olive Oil and lightly spraying with PAM and a little McButter. I have a 3g fat limit and I’m diabetic; so gotta watch it. Hope this helps. Blowing Wishes for a Wonderful Day Your Way. OMG…Absolutely amazing! 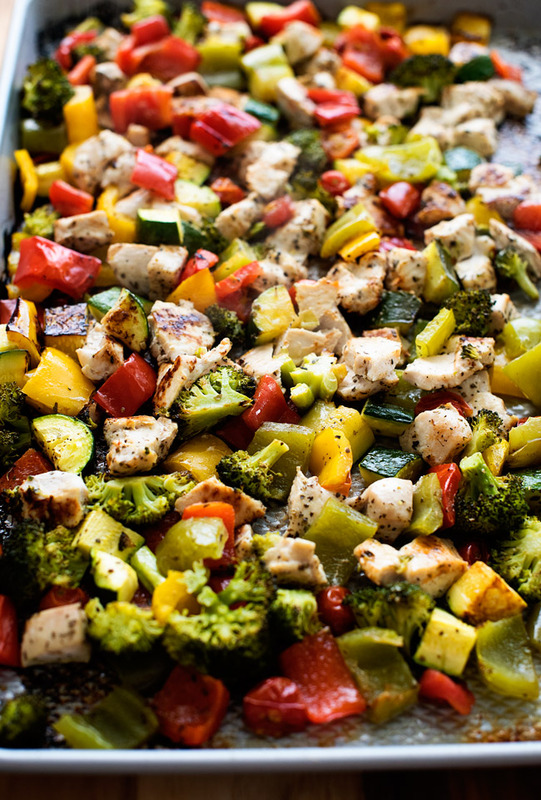 Who knew chicken and veggies could taste so good. Even the hubby likes it and is requesting it for lunch! This dish looks so delicious and I can’t wait to enjoy it for dinner tonight. Cannot wait to try! One question, how do you think it is warmed back up? I’m trying to meal plan and not sure how the veggies will be. Thanks! Having a party for 50. Can this be made for a large group? 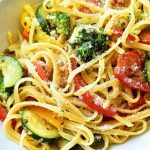 Can it be made ahead of time and reheated to serve later? 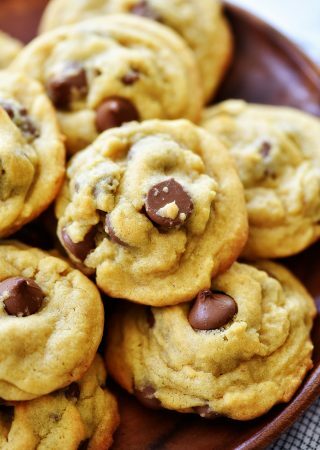 Can I use large foil containers to bake this? Or should I use cookie sheets? Do the ingredients need to all be flat on the bottom of the cooking pan? I added some garlic powder as well. 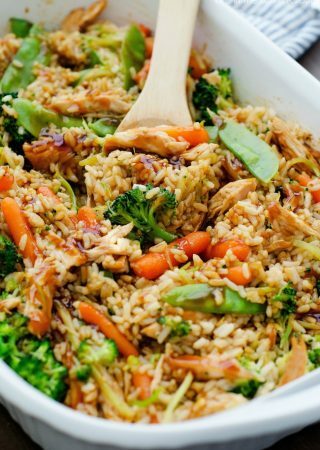 Very easy and yummy!